Promising improvements for developing accurate and cost-effective liquid biopsies as a non-invasive test to detect and monitor cancer. 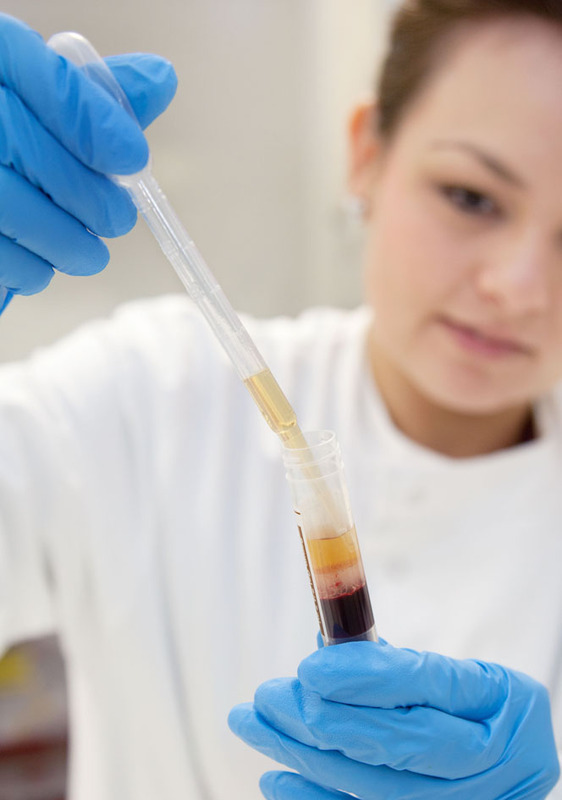 Recent research from the CRUK Cambridge Institute shows promising improvements for developing accurate and cost-effective liquid biopsies as a non-invasive test to detect and monitor cancer. Discarded fragments of DNA from dying tumour cells that end up in the blood or other body fluids are known as circulating tumour DNA (ctDNA). Detecting ctDNA in plasma is a bit like looking for a needle in a haystack because of the much larger amounts of DNA that come from leucocytes and other normal cells. One approach to this problem is to use very deep sequencing, but this is expensive and may detect mutations in normal cells that are not related to cancer. A different approach aimed at exploiting biological differences in DNA fragmentation between normal and cancer DNA was tested in a paper co-authored by Florent Moulière, Dineika Chandrananda, Anna Piskorz, and Elizabeth Moore, which featured on the cover and editorial of Science Translational Medicine and also in New Scientist. Researchers from Dr James Brenton’s and Dr Nitzan Rosenfeld’s labs measured the lengths of tumour DNA fragments in blood plasma samples from 200 patients with 18 different types of cancer, and compared them with DNA fragments in the blood of 65 healthy people. They found that the DNA fragments of ctDNA are shorter in length than fragments of normal DNA and the accuracy of liquid biopsies was significantly improved by simple and low cost methods that enrich for sequencing of these fragments. Importantly, these methods improved the detection of cancers that are difficult to diagnose like pancreatic cancer that don’t have high levels of ctDNA in the blood. They also showed that new patterns of fragmentation discovered using machine learning could be used to correctly classify plasma samples as being derived from patients with cancer without using mutation analysis. Detecting ctDNA from patients with brain cancer is even more challenging. To tackle this problem, Florent Moulière, Richard Mair and others in the Rosenfeld and Brindle labs, looked at whether or not they could detect brain tumour DNA fragments in cerebrospinal fluid (CSF) – the fluid that surrounds the brain and spinal cord. The researchers analysed the CSF in 13 patients with a type of brain tumour called a glioma. They detected tumour DNA in five (39%) of the patients and their findings are published in EMBO Molecular Medicine. Crucially, the team managed to spot these large DNA changes using a shallow whole-genome sequencing which detects copy number abnormalities. However, for many patients with brain tumours it may not be clinically feasible to take a sample of the CSF and in a second paper published in Cancer Research the group reported on ways of improving the detection of brain tumour DNA fragments in blood plasma. Co-authors Richard Mair and Florent Moulière also found that the tumour DNA fragments tend to be shorter than the non-tumour DNA fragments. They also found that analysing tumour mitochondrial DNA in the plasma could increase the sensitivity of blood plasma liquid biopsies.